Paperback and eBook is available on Amazon. Barn and Nobel and Apple iBooks. Please pass this unto your friends and family. Maybe you would help by leaving a review of the book one of these sites! Read and enjoy the mystery and discovery! Jesus Christ and study His word. Want to know where my help comes from? http://www.pestor.com will give you your answer. 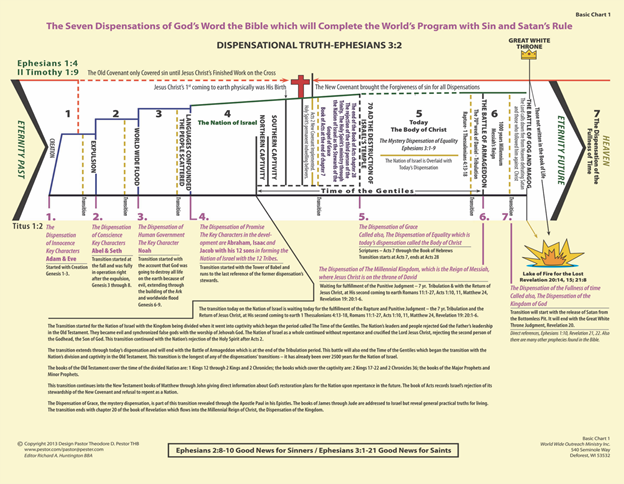 Order Dispensational Chart with a complete detailed explanation for a donation of $5.00. Comming soon Dispensational Book for grades 4th through adulthood for a donation of $20.00.